Sieda is currently processing LIHEAP, home energy assistance, applications for the general public in our seven counties. 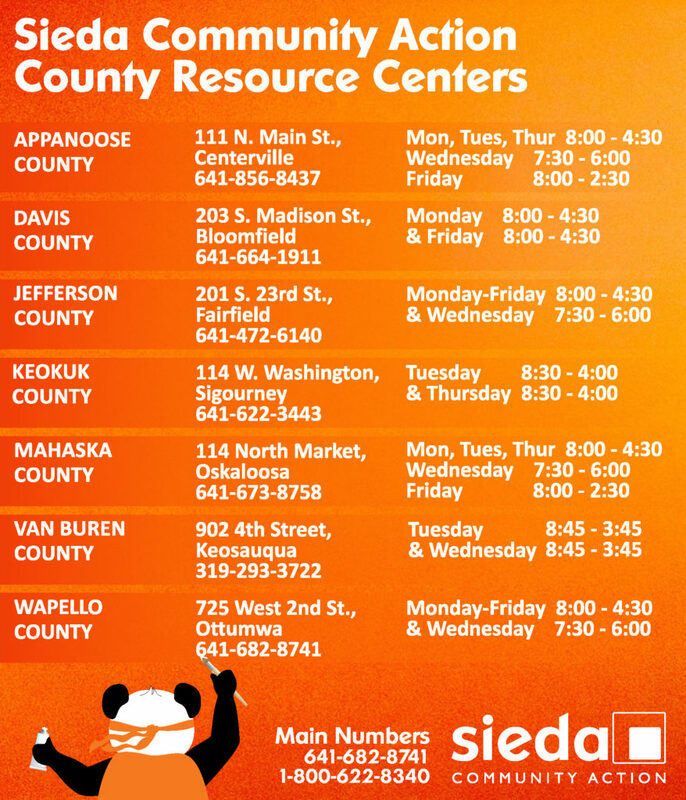 Appointments can be made at any of the Sieda Neighborhood Resource Centers or online from November 1, 2018, to April 30, 2019. If you do not live in one of our seven counties, please click here to find your counties Iowa Community Action Agency. The 2018-2019 LIHEAP was established to assist qualified low-income Iowa homeowners and renters. It helps pay for a portion of their primary heating costs for the winter heating season. The assistance amount is a one-time payment based on household income, household size, type of heating fuel, and type of housing. For your appointment, you will need verification of gross household earnings for the past 30 days or 2017 Federal Taxes, recent gas and electric bills, and Social Security Cards for all household members. If you have any questions regarding the application process, please contact the Sieda office in your county or call the main office at 1-800-622-8340 or 641-682-8741 extension 151.